Since the announcement of the Electro-Harmonix Canyon Delay & Looper pedal, I have been longing to check this cool stompbox out. I currently have a variety of delays, reverbs and a small loop pedal on my board so the opportunity to get more out of one pedal, rather than all the rest, was very exciting to me. Let’s dive into this pedal’s features! The most impressive part about the Canyon are its 11 modes: Digital Delay, Modulated Delay, Multi-Tape Delay, Reverse Delay, Deluxe Memory Man, Tape Delay, Reverb Plus Delay, Octave Delay, Shimmer, Sample & Hold and a Loop that holds up to 62 seconds in length. Tap tempo is always a must for any delay enthusiast and with the EHX Canyon, you can even use an external footswitch to control the tempo, which is especially handy with the Octave Delay for some cool psychedelic sounds. The internal Tails switch allows you to let the echoes repeat for days or stop them immediately when you are in bypass mode. The pedal also features hidden parameters, made available by the Secondary Knob Mode. This allows you to control most of the effects even further, which is a great asset to the Reverse Delay, letting you adjust the sensitivity of the pluck detection algorithm. All of this is achieved in a relatively small, well-designed package, so no heavy real-estate is required on your pedal board to access all of these amazing features. Any loop presets you record stay just where they are, even when you power down and power back up again. And, the effects sound brilliant and fresh – the EHX experience always comes through for getting the best tone out of your pedals. My favorite mode was the Reverb with Plus Delay – playing a cool riff made out of the lower end of the Phrygian Dominant scale, recorded with the higher end of the scale in the Shimmer mode allows for some very tasty melodies. 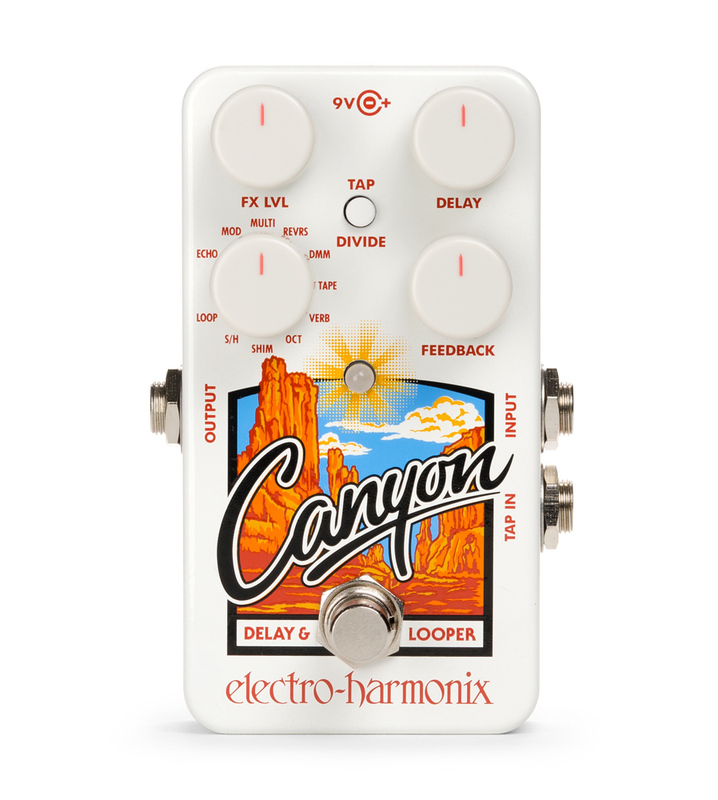 Another of my favorites aspects of the EHX Canyon is the Sample and Hold function, which repeats and emphasizes the strongest picks, allowing you to make some pretty cool melody patterns while emphasizing your bass note lines. If this is what being in a canyon is supposed to sound like, I am all for it! With so many pedals out in the market today, it’s easy to see why the Electro-Harmonix Canyon is an immediate win. I would highly recommend this pedal to folks looking to get into the pedal game. There is so much in such a small package, giving yourself hours of jam time in the future. Monique Hernandez-Fuentes is a pedal enthusiast from the Northern California Bay Area who also writes for GuitarTricks.com.